So, I just got back from Baja. La Ventana, precisely, also known as Hood River, South. It is a kite boarding, windsurfing mecca!! Very beautiful, with generally calm seas, though our first day there was pretty rough!!! But the water is relatively warm, and the sun was always shining. I figured with my surfing background and sailing background that kite boarding would be a breeze...just stand up and go!! Boy, was I wrong!!!! After doing countless body-drags, or chumming for sharks, I tried to stand up on the board. I ended up sailing through the air, going the wrong way, flat out horizontal, looking up at the sky, thinking, "Wow, this is REALLY going to hurt!" And after landing flat on my back, I decided that I was right...it did really hurt! My son-in-law, Tyler, made it look soooooo easy!! He was Mr. Nonchalant!! Casually walking just enough into the water to put on his board, drop the kite, and GO! He had an incredibly relaxed attitude to the whole thing. He could catch HUGE air, 20' high, and travelling about 100' through the air, and casually land and go. It was beautiful to watch. 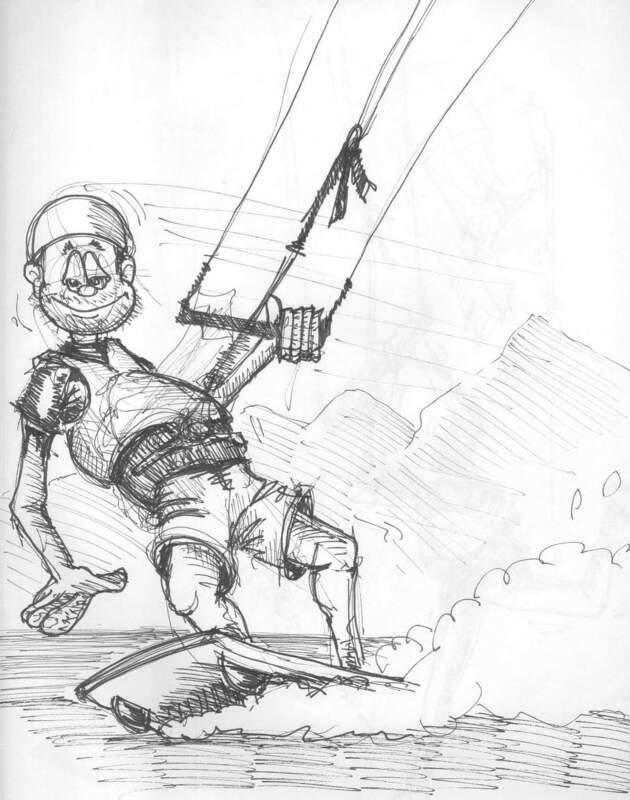 So, this drawing is out of my sketch book, and I think it really captures the casualness with which Tyler kite boards. He is a joy to watch!! And I may try this again, but I have to let my bones forget what I did to them! !